For other uses, see Villa (disambiguation). A villa was originally an ancient Roman upper-class country house. Since its origins in the Roman villa, the idea and function of a villa has evolved considerably. After the fall of the Roman Republic, villas became small farming compounds, which were increasingly fortified in Late Antiquity, sometimes transferred to the Church for reuse as a monastery. Then they gradually re-evolved through the Middle Ages into elegant upper-class country homes. In modern parlance, "villa" can refer to various types and sizes of residences, ranging from the suburban semi-detached double villa to residences in the wildland–urban interface. Roman writers refer with satisfaction to the self-sufficiency of their latifundium villas, where they drank their own wine and pressed their own oil. This was an affectation of urban aristocrats playing at being old-fashioned virtuous Roman farmers, it has been said that the economic independence of later rural villas was a symptom of the increasing economic fragmentation of the Roman Empire. Archaeologists have meticulously examined numerous Roman villas in England. Like their Italian counterparts, they were complete working agrarian societies of fields and vineyards, perhaps even tileworks or quarries, ranged round a high-status power centre with its baths and gardens. The grand villa at Woodchester preserved its mosaic floors when the Anglo-Saxon parish church was built (not by chance) upon its site. Grave-diggers preparing for burials in the churchyard as late as the 18th century had to punch through the intact mosaic floors. The even more palatial villa rustica at Fishbourne near Winchester was built (uncharacteristically) as a large open rectangle, with porticos enclosing gardens entered through a portico. Towards the end of the 3rd century, Roman towns in Britain ceased to expand: like patricians near the centre of the empire, Roman Britons withdrew from the cities to their villas, which entered on a palatial building phase, a "golden age" of villa life. Villae rusticae are essential in the Empire's economy. With the decline and collapse of the Western Roman Empire in the fourth and fifth centuries, the villas were more and more isolated and came to be protected by walls. In England the villas were abandoned, looted, and burned by Anglo-Saxon invaders in the fifth century. But the concept of an isolated, self-sufficient agrarian working community, housed close together, survived into Anglo-Saxon culture as the vill, with its inhabitants – if formally bound to the land – as villeins. From the sixth to the eighth century, Gallo-Roman villas in the Merovingian royal fisc were repeatedly donated as sites for monasteries under royal patronage in Gaul – Saint-Maur-des-Fossés and Fleury Abbey provide examples. In Germany a famous example is Echternach; as late as 698, Willibrord established an abbey at a Roman villa of Echternach near Trier, presented to him by Irmina, daughter of Dagobert II, king of the Franks. Kintzheim was Villa Regis, the "villa of the king". Around 590, Saint Eligius was born in a highly placed Gallo-Roman family at the 'villa' of Chaptelat near Limoges, in Aquitaine (now France). The abbey at Stavelot was founded ca 650 on the domain of a former villa near Liège and the abbey of Vézelay had a similar founding. The Villa Madama, the design of which, attributed to Raphael and carried out by Giulio Romano in 1520, was one of the most influential private houses ever built; elements derived from Villa Madama appeared in villas through the 19th century. Villa Albani was built near the Porta Salaria. Other are the Villa Borghese; the Villa Doria Pamphili (1650); the Villa Giulia of Pope Julius III (1550), designed by Vignola. The Roman villas Villa Ludovisi and Villa Montalto, were destroyed during the late nineteenth century in the wake of the real estate bubble that took place in Rome after the seat of government of a united Italy was established at Rome. In the later 16th century in the northeastern Italian Peninsula the Palladian villas of the Veneto, designed by Andrea Palladio (1508–1580), were built in Vicenza in the Republic of Venice. Palladio always designed his villas with reference to their setting. He often unified all the farm buildings into the architecture of his extended villas. Examples are the Villa Emo, the Villa Godi, the Villa Forni Cerato, the Villa Capra "La Rotonda", and Villa Foscari. In many ways the late 18th century Monticello, by Thomas Jefferson in Virginia, United States is a Palladian Revival villa. Other examples of the period and style are Hammond-Harwood House in Annapolis, Maryland; and many pre-American Civil War or Antebellum Plantations, such as Westover Plantation and many other James River plantations as well dozens of Antebellum era plantations in the rest of the Old South functioned as the Roman Latifundium villas had. A later revival, in the Gilded Age and early 20th century, produced The Breakers in Newport, Rhode Island, Filoli in Woodside, California, and Dumbarton Oaks in Georgetown, Washington, D.C.; by architects-landscape architects such as Richard Morris Hunt, Willis Polk, and Beatrix Farrand. 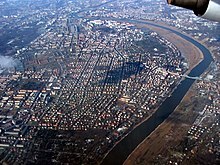 Aerial view of giant "villa colonies" (Villenkolonien) in Dresden, Germany: Gründerzeit quarters of Blasewitz (incl. Tolkewitz and Striesen), Gruna and Johannstadt. 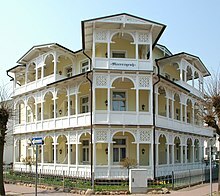 The second half of the nineteenth century saw the creation of large "Villenkolonien" in the German speaking countries, wealthy residential areas that were completely made up of large mansion houses and often built to an artfully created masterplan. Also many large mansions for the wealthy German industrialists were built, such as Villa Hügel in Essen. The Villenkolonie of Lichterfelde West in Berlin was conceived after an extended trip by the architect through the South of England. Representative historicist mansions in Germany include the Heiligendamm and other resort architecture mansions at the Baltic Sea, Rose Island and King's House on Schachen in the Bavarian Alps, Villa Dessauer in Bamberg, Villa Wahnfried in Bayreuth, Drachenburg near Bonn, Hammerschmidt Villa in Bonn, the Liebermann Villa and Britz House in Berlin, Albrechtsberg, Eckberg, Villa Stockhausen and Villa San Remo [de] in Dresden, Villa Waldberta [de] in Feldafing, Villa Kennedy [de] in Frankfurt, Jenisch House and Budge-Palais in Hamburg, Villa Andreae [de] and Villa Rothschild [de; ar; fr] in Königstein, Villa Stuck and Pacelli-Palais [de] in Munich, Schloss Klink at Lake Müritz, Villa Ludwigshöhe in Rhineland-Palatinate, Villa Haux in Stuttgart and Weinberg House in Waren. In France the Château de Ferrières is an example of the Italian Neo-Renaissance style villa – and in Britain the Mentmore Towers by John Ruskin. A representative building of this style in Germany is Villa Haas (designed by Ludwig Hofmann) in Hesse. In Denmark, Norway and Sweden "villa" denotes most forms of single-family detached homes, regardless of size and standard. Today the term "villa" is often applied to vacation rental properties. In the United Kingdom the term is used for high quality detached homes in warm destinations, particularly Florida and the Mediterranean. The term is also used in Pakistan, and in some of the Caribbean islands such as Jamaica, Saint Barthélemy, Saint Martin, Guadeloupe, British Virgin Islands, and others. It is similar for the coastal resort areas of Baja California Sur and mainland Mexico, and for hospitality industry destination resort "luxury bungalows" in various worldwide locations. In Australia "villas" or "villa units" are terms used to describe a type of townhouse complex which contains, possibly smaller attached or detached houses of up to 3–4 bedrooms that were built since the early 1980s. In New Zealand the term "villa" is commonly used to describe a style of wooden weatherboard house constructed before World War I characterised by high ceilings (often 12 ft), sash windows, and a long entrance hall. In Cambodia "villa" is used as a loanword in the local language of Khmer, and is generally used to describe any type of detached townhouse that features yard space. The term doesn't apply to any particular architectural style or size, the only features that distinguish a Khmer villa from another building are the yard space and being fully detached. The terms "twin-villa" and "mini-villa" have been coined meaning semi-detached and smaller versions respectively. Generally, these would be more luxurious and spacious houses than the more common row houses. The yard space would also typically feature some form of garden, trees or greenery. Generally, these would be properties in major cities, where there is more wealth and hence more luxurious houses. ^ These are not to be confused with the English country houses, which were centres of political and cultural power and show surrounded by the estates that supported them, such as Holkham Hall, Alnwick Castle or Woburn Abbey; in Ireland Castletown House and Russborough House are comparable examples. ^ Klaus F. Müller: Park und Villa Haas – Historismus, Kunst und Lebensstil. Verlag Edition Winterwork, 2012, ISBN 978-3-86468-160-8.